Get the Best Deals! From the Best HGH Supplements & Brands! 90 DAY – Money Back Guarantee! 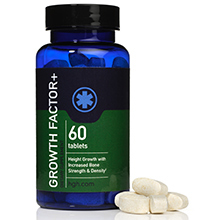 Growth Factor Plus is a very popular HGH supplement that will help you to effortlessly add a few inches in height and also provide bone &amp; joint support. The secret behind Growth Factor’s success lies in one very special ingredient, which along with a blend of vitamins, minerals and herbs, acts as building blocks for healthy joints, cartilage and bones. This proven HGH supplement can be used by anyone who is over 18 years old and is looking to add a few inches in height, without the use of injections. Buy Growth Factor Plus Online – With a 90-Day Money Back Guarantee! consisting of l-ornithine, l-arginine, l-lysine, l-tyrosine, l-glutamine, Pituitary Anterior Powder, Soy Protein Isolate etc. These very specialized ingredients were identified after years of research by a dedicated team of scientists. These ingredients combine efficiently and help in lengthening the cartilage discs that exist between the 33 vertebrae in the spinal column and increase the spinal length. This is how you get those few additional inches in height. Growth Factor Plus will not promise that you will gain say, a stunning 6-inch in height. No such extravagant claims are made. What Growth Factor Plus will certainly do is ensure that you put on anywhere between 1 to 3 inches in height over a span of 2 to 3 months. Moreover it will also strengthen your bone and joint structure. We offer an exclusive 90-day money back guarantee with your purchase of Growth Factor Plus. Which means that, if you are not satisfied with the results, all you have to do is return the empty/used bottles to us and we will give you a full refund minus a nominal shipping and handling charge. © 2019 E-HGH. All rights reserved.